AvelCain - New Releases + New Member Joined | VKH Press – J-Rock & Visual Kei Coverage Worldwide! 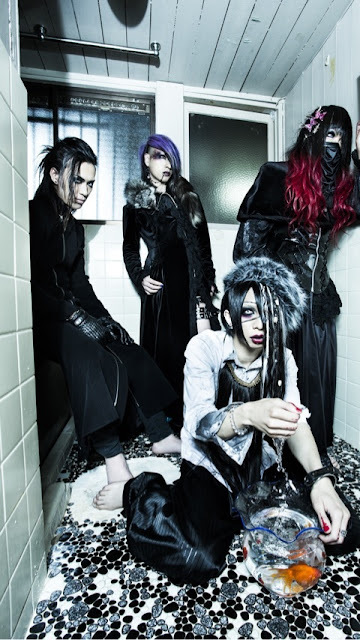 Already back in July, AvelCain hinted that there will be some important changes for the band after their performance on August 29th at TSUTAYA O-East. And fortunately they made this promise come true: Drummer 秒 (byou) has officially joined them today! You can follow him on twitter here. Moreover, they announced the release of two new CDs! A new live-limited single entitled 紅-べに- (beni) will be available on September 19th at their live held at Ikebukuro EDGE. It costs 1000 yen and is limited to 300 copies. A lyric booklet with four pages will be included. There is going to be a fiveStars limited version of the release too. It comes with the track ×月×日、懺悔、寡黙ナル君二… (×gatsu×nichi, zange, kamoku naru kimi ni…) instead of 過食症 (kashokushou). Moreover, 聖子-seiko- one-coin single titled ヒマワリノウタ (himawari no uta) will be out on October 14th. It's price is 500 yen and it includes the title track only. Since it's limited to 500 copies, make sure to get yours as fast as possible!